Under the weather? Chicken soup, schmicken schoup. Brew up a big pot of this comforting vegetarian elixir instead. ‘Tis the season … for colds and flu, that is. Our house is recovering from a doozy of a bug right now, and I got the worst of it. It’s been a full week, and my appetite is still all but nonexistent. Strange how foods from childhood creep back into your consciousness when you’re sick. For me, one of the only foods I’ve been able to think about for the past week (without wanting to hurl) is Campbell’s chicken noodle soup. Briny, salty, comforting. Except, well, shoot. I don’t eat chicken these days, and I limit processed foods too. So what’s a comfort-seeking sickie to do? Make something just as comforting – and, actually, more so – that’s what! 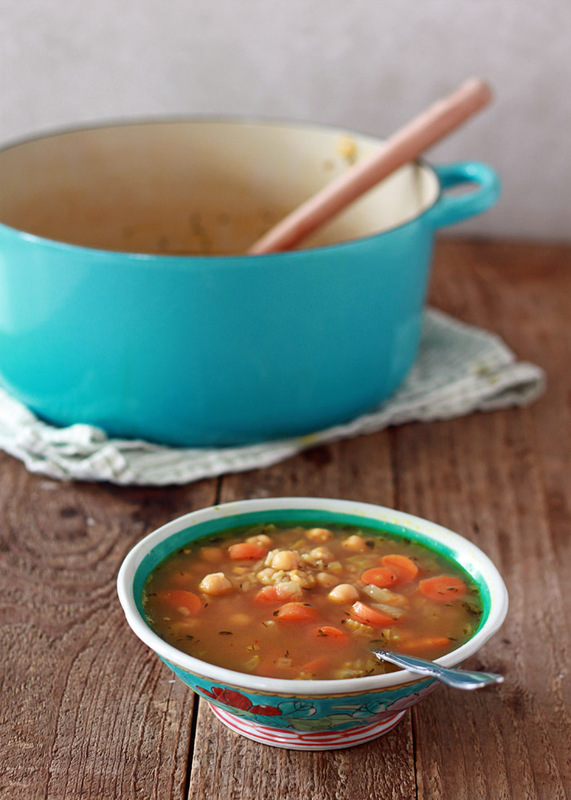 This Chickpea & Rice Soup is basically a vegetarian-friendly chicken and rice soup. It’s brothy, steamy, and satisfying … and it tastes like home. I’ve made vegetarian chicken soup recipes in the past, but they’ve all been vaguely unsatisfying. With this one, though, I think I’ve finally nailed it! The key is to give the broth a few magic touches to give it that rich, deep, satisfying flavor that chicken would otherwise impart. We start with a little olive oil and butter – using both adds an extra flavor note or two – and then we saute onions, celery, and carrot. Simple enough. Then we stir in garlic, dried thyme (because who has time to run to the store or out to the garden for fresh thyme when we’re under the weather? ), and even a little bit of that super-spice turmeric for health and that familiar yellow hue. 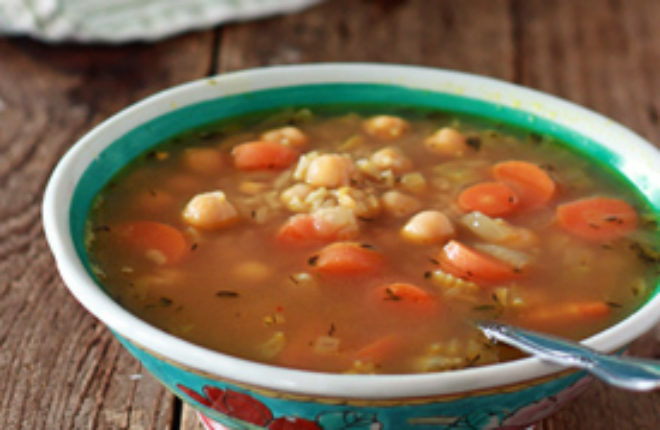 Broth, a bay leaf, some chickpeas … simmer, stir in some cooked rice. Scoop into bowls, swirl, sip, savor. Mmm mmm good. Let the healing begin. Heat the olive oil and butter in a medium-to-large soup pot over medium heat. Add the onion, carrots, and celery and saute, stirring, until the onions are cooked through and translucent, 5-6 minutes. Add the garlic, thyme, turmeric, bay leaf, red pepper flakes, and kosher salt. Stir, cooking, for about a minute. 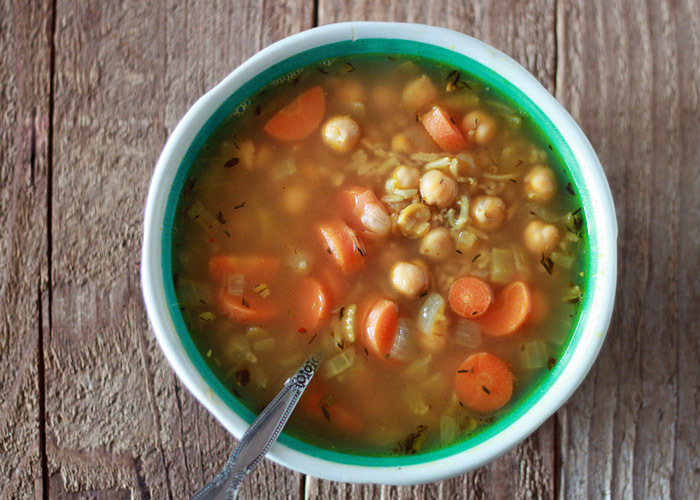 Stir in the vegetable broth and chickpeas. Increase heat to high and bring to a boil, then reduce to a simmer. Cover and simmer for 20 minutes. Stir in rice. Remove bay leaf. Taste and add additional salt and freshly ground black pepper if desired. Serve. Slow-Cooker 5-Ingredient Thai Butternut Squash Soup – this might just be my easiest soup recipe ever. 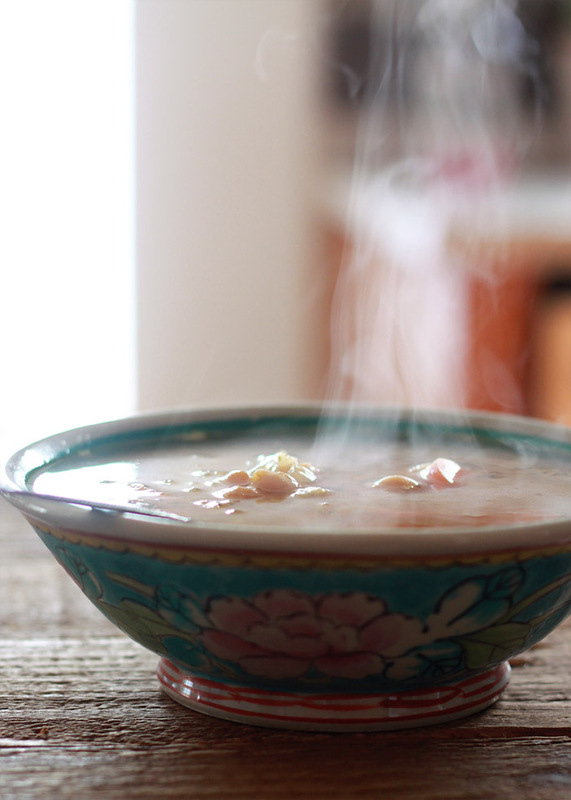 I am all about a steamy bowl of comforting soup, and seriously that photo with the steam is just amazing. Makes me want to put my face right up to it to warm up. So you know when you have all those leftover veggies and end up throwing them together in a soup since they are about to rot? 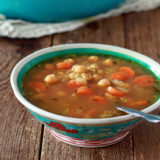 Well that same soup can needs modification and rice and chickpeas are an excellent complete protein to snazzy up the soup! This was delicious and easy! Thank you so much. I love your site. We too are a vegetarian/meat-eater family. Hi Tasneem, so glad you liked it! I am really kind of proud of this recipe – it is so simple, but it was hard to get right. 🙂 Nice to meet another member of the multivore family club! This was amazing – delicious, soothing and restorative! I made it when my husband and me were both were sick with an endless cold, and longing for the chicken soup of our pre-vegetarian days. I’m glad I found your blog and look forward to trying your other recipes. Hi Nancy! I’m so glad you liked it. I was so excited when I felt like I finally found a substitute for chicken noodle soup. Thank you for your nice words and I hope you and your husband are feeling much better. Wonderful recipe! We are a vegatarian & meateater house as well. I buy a prepared rotisserie chicken so my husband can add meat to the soup when it’s finished as an easy addition. How could I modify the recipe to add the uncooked rice directly to the soup so it cooks with it?